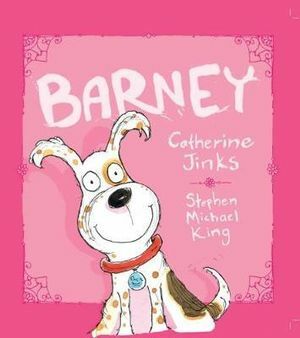 Barney is a lovely rhythmic rhyming love story about a little girl and her dog. Catherine Jinks has written a delightful short story that flows so easily off the tongue as you read the story aloud. It has the rhythm and beat that is familiar and comfortable, like a skipping or clapping game song. At the end of the story Jinks has created a wonderful aw moment as we find out what Barney loves more than food. Stephen Michael King's illustration style is instantly recognisable. His characters are expressive and show so much about their personality. The dynamic duo of Jinks and King have created a story not just about Barney as the title suggests. It is a story about a little girl and her family; her mum and dad, a baby brother, the family cat and Barney. We discover that the little is girl is responsible for walking Barney, that she doesn't like greens, she loves her stuffed toy that goes everywhere with her, she has a great imagination and just like Barney she loves to eat pizza. To make this book even more fun follow the doggy footprints and find your way through the hedge maze to some of the food that Barney loves. To find out more about Catherine Jinks see her answers to KBR's 12 Curly Questions and an interview about her trilogy City of Orphans. If you would like to know more about Stephen Michael King see his answers to KBR's 12 Curly Questions or read some books that he has written or illustrated; You, The Man Who Loved Boxes, Scary Night, Pea Pod Lullaby and Trouble and the New Kid.